You can't hear it, but I'm letting out a big sigh of relief right now. 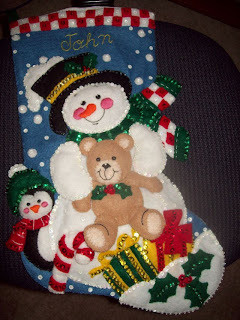 Tonight I finished the second of two Christmas stockings that I've been working on (off and on) for a year now. 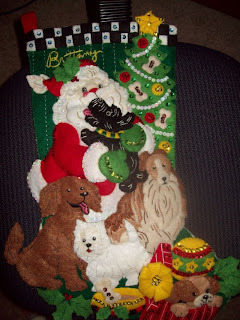 My mom started a tradition eons ago where she'd make every member of the family one of these extraordinarily over-the-top tacky felt stockings for Christmas. Clearly, I am also lacking in good taste because I love the unabashedly festive explosion of sequins and Santas, and when Tom and I got engaged, I continued the tradition by making him one (Santa and friends caroling), and then when Sam was born, I made him one, too (a bear, a snowman, and a rabbit sledding). I started this one for John right after he was born, but couldn't get it made in time for Christmas. It's been hanging over my head, making me crazy, ever since. Every time I'd open my craft armoire, I'd see the bag of half-finished stocking and it would wail plaintively, "FINISH MEEEEEEE!" Around the same time, I casually mentioned to my mom that as soon as I finished John's stocking, I needed to make myself a new one because at 30+ years old, it had certainly seen better days. She bought this one for me, started it, brought it with her to work on during her flight out here , and abandoned it, saying "You can finish it." Gee, thanks Mom. So it got shoved in the craft armoire too. And every time I opened the door, felt scraps fell on my head. Since I've been doing everything but writing lately, I found the time to clear these from my mental to-do list. Wow -- those are great! brittany, there is nothing tacky about these gems of craft and love. would that i could...i bow to your craftiness. those are very cute. and, though i don't think they're tacky, everyone's entitled to a little tacky at christmas!